Recently I posted in a few Facebook groups looking for people to comment questions for me to answer in an article. The response for the Mets has been great so far, and I'll have to split up the questions I've received into two articles. The second edition will be coming soon. A: Yes, I do. There are certainly a few holes that need to be plugged up in the offseason, but the foundation for a playoff contender has been laid. The rotation has the potential to be one of the best in the major leagues (I got another question about the rotation, so I'll cover that in depth in Part 2.) and the offense needs a couple of extra pieces (I'll get to that later as well), but overall we should be expecting to see the Mets in the thick of a playoff race next September. A: It's a little bit hard to tell exactly how much the payroll will be with Bobby Parnell, Daniel Murphy, Dillon Gee, Lucas Duda, Eric Young, Jr., Ruben Tejada, Jenrry Mejia, and Anthony Recker all eligible for arbitration, but Baseball-Reference estimates to all of those cases will cost about $22 million. The rest of the contracts aren't guaranteed, because of the way pre-arbitration contracts are structured in the MLB, but Baseball-Reference estimates that it will cost $6.5 million to lock up everyone else. So far, the payroll stands at $71.5 million for 23 players. Obviously these are just rough estimates to give an idea of exactly how much the Mets can spend this winter. I do not think that Gee will be on the team next season, and in this world where the payroll skyrockets to $110-120 million, there's no need for Jonathon Niese to be in Flushing either, because the Mets can sign an ace in free agency. Look at that! I just whittled down the payroll to $60.5 million for 21 players. Hanley Ramirez! I hope he likes blue and orange, because in a world where the Wilpons are big spenders, he's the answer to our problems at shortstop. He's 30 years old, and has hit .300/.373/.502/.874 in nine seasons so far. He started off like a star, before his level of play dipped a bit for a few years, and now it looks like his performance has averaged itself out. He's one of the top offensive shortstops in baseball, a position that is really lacking in great offensive talent. I'd give him a 5 year deal worth $85 million. There's still a lot of money left for the Fake Mets to spend, so let's look at adding to the rotation. With only Harvey, Wheeler, deGrom, and Syndergaard as locks for the rotation, they can sign a starter and look at trading away Rafael Montero. Enter: Max Scherzer. The 2013 AL Cy Young Award winner has made drastic improvements over the last couple of years that has turned him into one of the best pitchers in baseball. He's been a strikeout machine throughout his entire career, but by increasing the use of his breaking pitches last season, became one of the premier starters in the MLB. At 30 years old, he's in his prime, and should garner a lot of interest on the open market. I think he'll get a contract similar to Zack Greinke's, which is very indicative of his value. Much like Ramirez, I'll also give him a 5 year contract because of his age, but this one will be worth $125 million over the course of the deal. Because I have an almost comical amount of money to work with, I just doled out $42 million to two players, and still have $17.5 million to work with. The Mets need a corner outfielder, so Melky Cabrera would be a great signing. Forget the steroid from two years ago for a second, because he's been great this season while presumably clean. He's hitting .313/.368/.478/.846 for Toronto, and should demand a good amount of money on the open market. The Mets should give him a 3 year deal worth $39 million. There aren't many outfielders on the market who should demand big money this winter, so if the Wilpons are seriously going to increase the payroll by this much, they should win any possible bidding war for Cabrera. I still have $4.5 million left, so I'll give a well-deserved 3 year, $10 million contract to Cardinals relief pitcher Pat Neshek. With the $1.2 million that I have remaining, I'll allow the Wilpons to buy a nice trophy case for the World Series title that the Mets are winning next year. With this roster, they're easily one of the best teams in the MLB. Thinking that the Wilpons will almost double the payroll is over-optimistic, but should in case that actually happens, this is who I would get if I were Sandy Alderson. Now, who I would acquire under more realistic circumstances is an entirely different question, for which I'll save my answer for a future article. A: I'm all in on Syndergaard. I think he's going to be a star in this league, and will actually be better than Matt Harvey, as hard as that is to imagine. He has all of the tools to be our ace for many years to come, and great pitching is more important than great hitting. On the other hand, I would seriously look at trading Rafael Montero and Steven Matz in the right trade. Obviously other prospects like Cory Mazzoni, Marcos Molina, and Blake Taylor are also up for grabs, but they'd have to be packaged in with someone of real value in order to net a stud. And no, I'm not saying that they should trade Montero because he hasn't impressed in his short major league career. He's very talented, but the Mets have a plethora of pitching, and he has just the right amount of value to bring back a good return. Both he and Matz are highly regarded by front offices around the league, and many teams who are struggling for young pitchers would love to take on one or both of these players. Now the question is, who would they be getting in return. It would be foolish and way too optimistic of me to say that Giancarlo Stanton will ever be donning a Mets uniform, unless of course he's 38 years old and his career is almost over, then of course by all means. There's so much talk about the Marlins trading him, but I don't see it happening. They're a rebuilding franchise and he's their cornerstone. Also, I don't see any team that can actually give Miami equal value for Stanton, including the Mets because it would probably have to include Sydnergaard, Montero, and Matz; or Syndegraard and Wheeler; or some other insane combination of young pitchers. There were a lot of Mets fans ready to give up Syndergaard, Montero, Matz, Wilmer Flores, Harvey, Wheeler, deGrom, David Wright, Gary Cohen, the home uniforms, Tom Seaver's retired number, the 1986 championship trophy, and the 1969 championship banner in exchange Troy Tulowitzki at the trade deadline. His injury history is quite worrisome, as he's only played more than 126 games three times in his eight full seasons. There's no way that I'd trade for him if Colorado is going to demand that we give them either Syndergaard or the whole farm. If they were willing to take either Montero or Matz and Wilmer Flores, then I'd listen because 120 games of Troy Tulowitzki and 42 games of literally playing without a shortstop (I'm talking about actually using seven position players. Yes that would leave Daniel Murphy alone to cover both middle infield spots. Wow that's a scary prospect) would be better than 162 of Ruben Tejada/Wilmer Flores/Omar Quintanilla. If Sandy Alderson traded away anything more for Tulowitzki, Rockies General Manager Adele Armagost would have to be sent to prison for grand larceny. The same problem exists for Carlos Gonzalez, as he has trouble staying on the field as well. The five players who I'd be in constant talks for are Joc Pederson, Jorge Soler, Arismendy Alcantara, Starlin Castro, and Javier Baez. Pederson, the 18th best prospect in the game according to MLB.com, is currently in AAA in the Dodgers' system, and has been tearing apart the PCL this year, hitting .302/.425/.573/.998 in 106 games. He has the range to play center field, so placing him in right (because Granderson is most likely moving to left field next season) next to Lagares would be great for the Mets defensively. He's a five tool player who will be a perennial All-Star. I don't know how likely the Dodgers are to trade away Pederson, but it's certainly a more plausible option than Stanton. Currently the Los Angeles outfield is filled with Yasiel Puig, Matt Kemp, and two underperforming guys in Carl Crawford and Andre Ethier. They'll try to move two of Crawford, Kemp, and Ethier in order to feature Pederson next season, but before they can do so, Sandy Alderson should offer up a package centered around Montero or Matz, along with either Brandon Nimmo or Matt den Dekker. The next four players are all Cubs, because it makes perfect sense for the two teams to trade with one another. Both are rebuilding franchises with loads of major league ready talent in their minor league system that should make both teams Wild Card contenders next season, and powerhouses in the near future. Both are trending in the same direction, and that is upwards, and quickly. I fully expect both the Cubs and Mets to sniff World Series titles within the next three to five years. What makes the two teams soulmates in the trade category is that the Mets have a wealth of pitching prospects, and holes to fill in their lineup, whereas the Cubbies are loaded with major league ready hitters, and could use some help with their pitching staff. Soler is an outfielder while Alcantara, Castro, and Baez are all middle infielders capable of playing shortstop. When super-prospect Addison Russell, another shortstop, was acquired in the trade that sent Jeff Samardzija to the Athletics, it seemed to be that the Cubs had too many potential infielders, especially when including third baseman Kris Bryant in the mix. They may have found the solution by moving Alcantara to centerfield, Baez to second, and will end up moving Bryant to the corner outfield, and shifting Castro over to third to make room for Russell. But, it still makes sense for them to find some young pitching by giving up one of their many young hitters. Castro is said to be untouchable, but if Baez really impresses through the end of this season, plans will change. Castro is not amazing, only hitting .283/.324/.408/.732 because he never draws walks, and his power comes and goes at times, but he'd be a significant upgrade over the Tejada/Flores combination that the Mets have been using. I would trade either Montero or Matz for him. Alcantara has hit .284/.337/.437/.774 over his six years in the minor leagues. He's developed a lot recently, as he's been hitting some a lot more power in the last couple of seasons, and slugged .537 in Triple-A this season before making his major league debut. So far he has done nothing in 32 games, but there's nothing to worry about. He'll be fine in the end. He could end up being similar in value to Castro, with more power and less pure contact. Once again, I'd be happy to see the Mets trade away Montero or Matz in exchange for Alcantara, especially since he's proven to be capable in the outfield already, or he could be useful both at short and in a corner outfield spot, depending on who Sandy Alderson acquires this winter. Baez is a powerful, free swinging 21 year old who is currently the #5 prospect in baseball according to MLB.com's rankings. He hit .278/.336/.545/.881 in his minor league career, and hit 4 home runs in his first 9 major league games after getting the call this month. I would consider giving up both Montero and Matz for Baez, along Wilmer Flores, if Theo Epstein demands for him. Baez young and he's going to be a star, so I'd give up a lot for him if need be. Another possible Cub is right fielder Jorge Soler, the 51st best prospect in baseball. 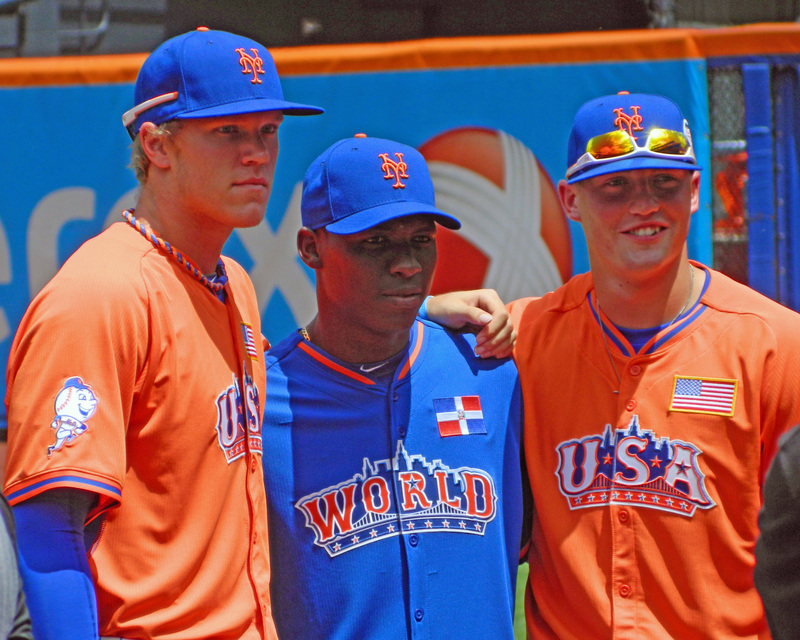 Since being signed from Cuba, Soler has been showcasing his pure hitting ability, amazing power, and a great deal of patience, hitting .303/.379/.537/.917. I don't know how willing the Cubs would be to trade him away, as they don't have an immediate answer in a corner outfield spot. But, if the Mets give them Brandon Nimmo, along with Montero or Matz, the Cubs can use a stopgap until Nimmo's ready to debut. Wow I didn't mean to write an entire article to answer that question, so here's Bartolo Being Bartolo just to give you a break. A: You may have just answered your own question. J-Lag is easily top three on the team along with D-Gee and A-Rec. I'd say that J-Lag is the best because there's an actual thing known as jetlag. Though I'd rather not associate a baseball player with being extremely tired. It feels wrong. If I were to cheat a little bit, I could throw C-Gran in there. J-Fam and B-Car are probably the next men up. All of sound cool enough, especially in comparison to the rest of the nonsense that you'll see when going through the Mets roster. In terms of comedic relief, some of the more awful nicknames are K-Nie, M-den, Z-Whe, R-Mon and W-Flo because, as a guy whose name also starts with W, I can attest to the fact that W is a letter than simply doesn't roll off the tongue under any circumstances. T-d'Ar and J-deG both look absolutely horrible on paper, while K-Nie and J-Mej are simply hard to pronounce. His debut was very solid, and his third start was absolutely incredible. 6 innings of 2-hit, 1-run ball and 10 strikeouts is one of the best games pitched by a Met this season. Each of those starts were followed up by a bad outing in which he couldn't even get through five innings, but that's the type of inconsistency that comes with being a rookie in the MLB. Montero's 3.28 ERA is fourth in the Pacific Coast League for pitchers with at least 15 starts, which is even more impressive when you take into account that the average ERA in the offense-heavy PCL is 4.59, and his home ballpark in Las Vegas is a pure hitter's park thanks to the dry air and elevation, causing it to have a very Coors Field-esque effect on games. Since getting sent back down to the minors in May, he's had a 2.58 ERA, and had two amazing starts leading up to deGrom's injury, allowing him to get called back up. How amazing? Try 14.2 scoreless innings with 17 strikeouts while giving up only 4 hits and 4 walks. Not good enough for you? That last start was probably the best game pitched by any Met at any level of the organization this season: 8 innings, 1 hit, 2 walks, and 11 strikeouts. On the other hand, Syndergaard has a 4.76 ERA this season, and since Montero rejoined him in Vegas, Thor has had a 5.57 ERA. Those numbers are somewhat skewed by a couple of disastrous outings, but they're really nothing to look at. He's been pitching well recently, and those numbers don't really worry me when it comes to how they'll translate to the major leagues, but he hasn't been anywhere close to as good as Montero recently. The biggest reason why it made absolutely no sense to call up Syndergaard to make two starts, is because it would be a complete mishandling of the team's top prospect from a developmental standpoint. He's not 100% ready to face the highest level of competition yet, so why should he be rushed up? With a prized prospect like Syndergaard, he shouldn't debut in a spot starting role. He should only get the inital call if there's an actual spot for him in the rotation in the long term. Montero's a different case because he already has major league experience, so bringing him back for two outings isn't a big deal. A: Competitive eating legend Joey Chestnut holds the world record for Krystal burgers (very similar to White Castle in size and shape) by eating 103 burgers in 8 minutes. That's just under 219 burgers in 17 minutes. Colon is no Joey Chestnut, because he doesn't have the same pedigree when it comes to professional eating, but he definitely knows how to put down quite a few burgers. How well? I looked at his fWAR (FunGraphs Weight Above Replacement) and found that he's leading the league by a significant margin. I also was able to find that he's fourth in the MLB, just behind Prince Fielder, Adam Dunn and for whatever reason, Eric Sogard, in fewest chews per minute, which greatly enhances his ability to eat a lot in a short time. After doing some calculations, I discovered that Colon would be able to eat roughly 167 White Castle burgers in 17 minutes. Maybe this will become a new part of his pregame routine.